Daylighting is the practice of using natural light to illuminate interior spaces. This is achieved by choosing the right kind of windows and positioning them where they can let the most natural light in. Natural light is good for more than just getting your daily dose of Vitamin D, according to several studies on daylighting and its benefits to human health. In a 1984 issue of Science magazine, a study was conducted on two groups of postoperative patients. The first group was placed in daylit recovery rooms while the second had only a brick wall outside their window. The patients in the first group recovered 8.5% faster and required less recovery medication compared to the other group. A different study conducted by the Pacific Gas and Electric Company conducted in 1999 and supplemented in 2002 reported a high correlation between high test scores and daylit classrooms. Other studies produced conclusive evidence on how daylighting regulates human “body clocks”. Subjects who worked in windowless workplaces tend to have disrupted sleep cycles, some which later led to chronic sleep debt and fatigue. Access to daytime-nighttime cycles in your home can help prevent these effects. If your home requires a lot of electrical lighting during the day, it’s likely taking up a significant portion of your monthly electrical consumption. If this is the case, consider getting energy efficient windows optimized for daylighting. The Energy Information Administration reports that up to 30% of an average home’s energy consumption is spent on lighting, along with electronics and other appliances, while 42% is spent on heating alone. Reducing your reliance on these two can result in significant energy savings. Optimizing your home for daylighting involves choosing large windows for your walls that face east to west, which follows the sun’s path and ensures that you will have ample amounts of natural light throughout the day. Our High-Performance™ Low-E4® glass ensures that you can enjoy natural light as much as you want without worrying about the effects of UV rays. Combined with our exclusive Fibrex® material frames, you can expect exceptional performance and energy efficiency all year round. 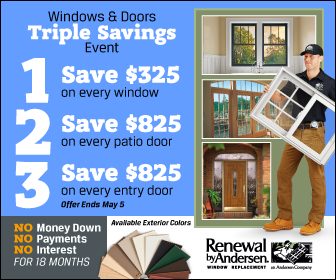 To learn more about our daylighting-optimized window styles like casement windows, call Renewal by Andersen® of St. Louis today at (314) 332-2364. Alternatively, you can fill out our contact form to schedule a free in-home consultation with our experts. We serve St. Charles, MO and nearby areas in Missouri.